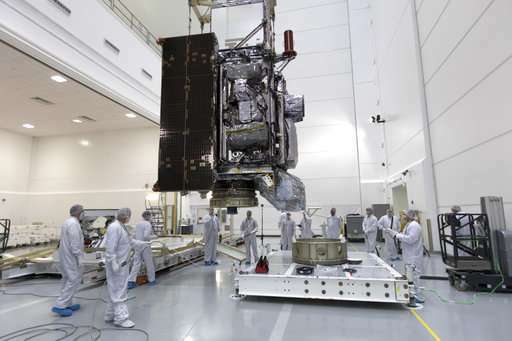 The nation's newest weather satellite, launched less than three months ago, has a serious cooling problem that could affect the quality of its pictures. The trouble is with the GOES-17 satellite's premier instrument for taking images of hurricanes, wildfires, volcanic eruptions and other natural calamities, the National Oceanic and Atmospheric Administration said Wednesday. The imager's infrared sensors aren't getting properly cooled. Experts are scrambling to understand what went wrong and how to fix it. Officials expect it will take at least a few months to figure out. "As you can imagine, doing this remotely from 22,000 miles below only looking at the on-orbit data is a challenge," said Steve Volz, head of NOAA's satellite and information service. NOAA stresses that three other GOES satellites in orbit, including GOES-16 launched in 2016, are healthy and meeting forecasting needs. Launched in 2016 as the first in a $11 billion effort to revolutionize forecasting, GOES-16 monitors the Atlantic and East Coast. GOES-17, the second in the series, is intended to provide the same sophisticated coverage for the western U.S. and Pacific region. Volz told reporters the trouble was discovered three weeks ago during the satellite's routine checkout in orbit. The satellite was launched by NASA on March 1 from Cape Canaveral, Florida. "This is a serious problem," Volz said. The infrared channels "are important elements of our observing requirement, and if they are not functioning fully, it is a loss." The problem is limited to the 13 channels in the infrared and near infrared, which are meant to operate at around minus 350 degrees Fahrenheit (minus 200 degrees Celsius). The imager's cooling system—which uses propolyne—is not maintaining that frigid temperature during the warmer part of each orbit, and so the channels aren't working well about half the time. The three channels operating in the visible light are unaffected. An identical imager on the GOES-16 satellite, launched in 2016, has been operating perfectly. So have similar imagers on a pair of Japanese weather satellites. The imagers are built by Harris Corp., based near Cape Canaveral. GOES-16 stunned meteorologists with its astonishingly fast, crisp images of last summer's flooding from Hurricane Harvey in Houston, and then of Hurricanes Irma and Maria as the massive storms approached the Caribbean and U.S.
"We expected the same performance, and we still hope for that," Volz said. NOAA's next satellite in the series, which would become GOES-18, isn't due to launch until 2020, but the date might be moved up if necessary, according to Volz.